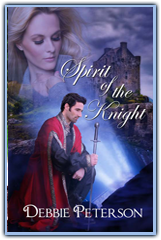 Renowned artist Mariah Jennings, hired to paint a thirteenth century Scottish castle, gets the shock of her life when she encounters the handsome knight who has dominated a lifetime of portraits and sketchbooks. But Sir Cailen Braithnoch is no ordinary ghost, nor did he suffer an ordinary death. Magic of the blackest kind cast a pall over the knights centuries ago. As the ghost and his lady seek to unravel the paradox surrounding his death, black arts, otherworldly forces, and a jealous rival conspire against them. Will fate keep them apart, or is their love destined to last through the ages?